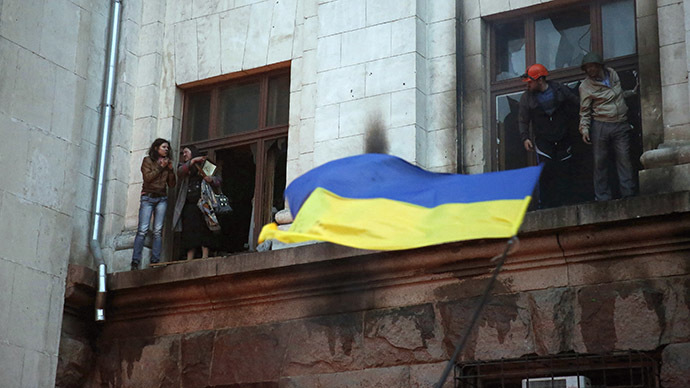 Radicals set the building with innocent people inside on fire in Odessa, then strangled the survivors and finished them with bats, while police did nothing to prevent the bloodshed. 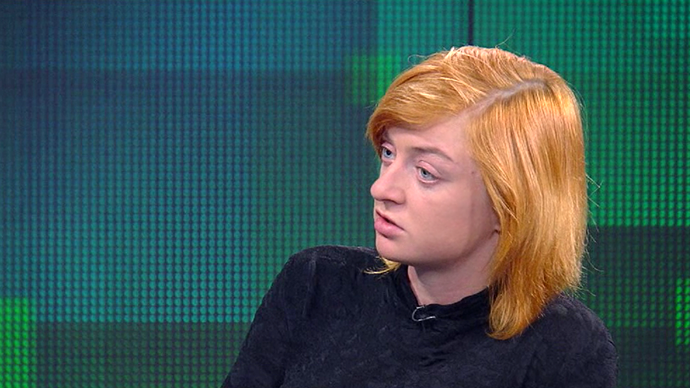 That’s the scary picture a survivor of the massacre told RT. 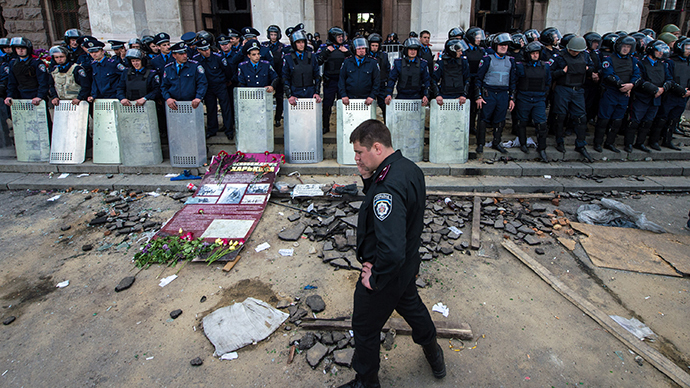 “First of all, nobody expected such cruelty, and secondly, it was too late to escape,” Tatyana Ivananko told RT’s correspondent Alexey Yaroshevsky about the Odessa tragedy on May 2, after which at least 46 people died in flames, when radicals set ablaze the local House of Trade Unions with anti-government protesters trapped inside. According to the witness, pro-autonomy activists wanted to hide from the radicals by barricading themselves in the building. “On our way up the stairs, we were taking plywood sheets inside so that we could block the doors and prevent them from getting into the building,” she says. However, the crowd of pro-government supporters who were trying to enter the building was quickly becoming bigger. “They were coming from everywhere,” she added. According to Tatyana, the radicals started hurling Molotov cocktails, after which the first and the third floors of the House of Trade Unions burst into flames. Tatyana also recalled that the outraged crowd outside was shouting that they wouldn't let anybody out. Public services such as police and fire brigade were not rushing to rescue the injured people. 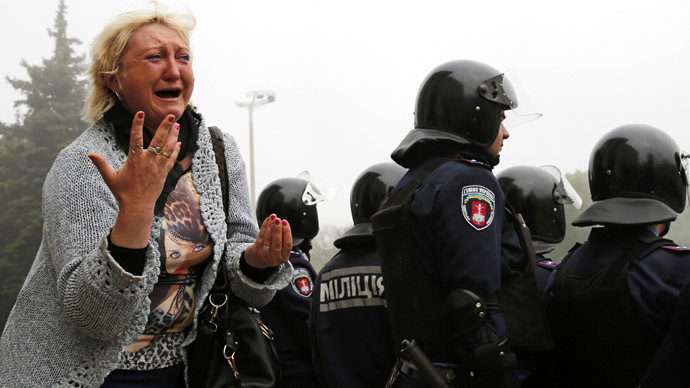 According to the numerous videos released in the Internet, many victims of the Odessa massacre received bullet wounds. On some of the videos a man in a bulletproof vest who introduces himself as sotnik Mykola (“sotnik” is what Maidan group leaders in Kiev call themselves) is shooting several times in the direction of the burning House of Trade Unions. 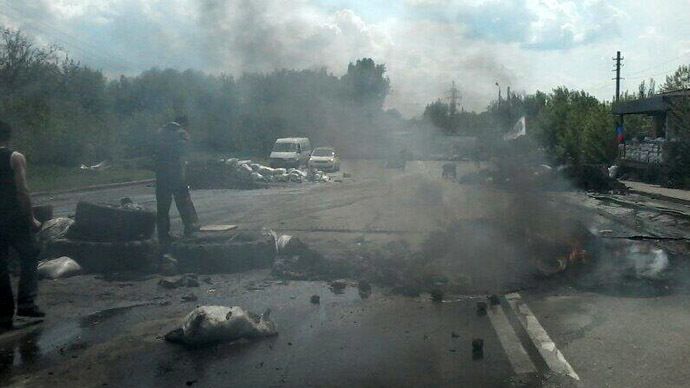 According to her, the shooting started in Grecheskaya Street, in the north of the city. 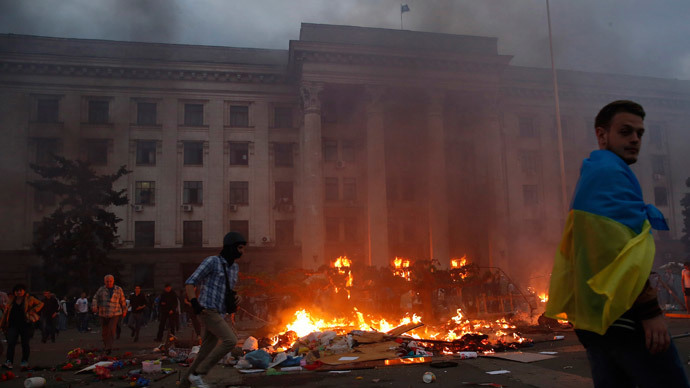 Tatyana said that after the pro-government activists managed to enter the burning building, “many people were strangled. I didn’t know how they [pro-government activists] were able to get through the fire but they did,” she added. “17-year-old hooligans were finishing people with bats,” she added. 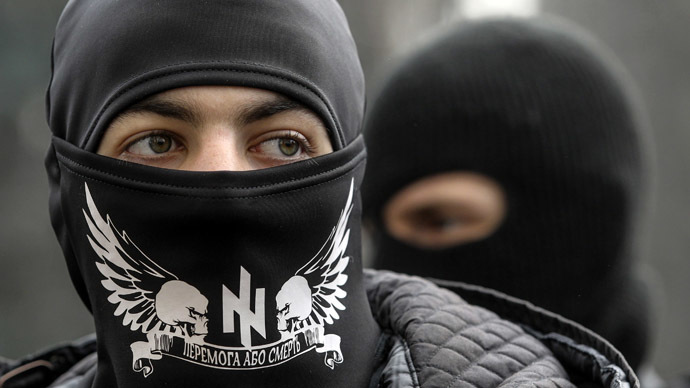 Meanwhile, the next day after the clashes, Ukraine’s Vice President, Vitaly Yarema, said that some of those who were killed in the Trade Union building were foreign nationals. 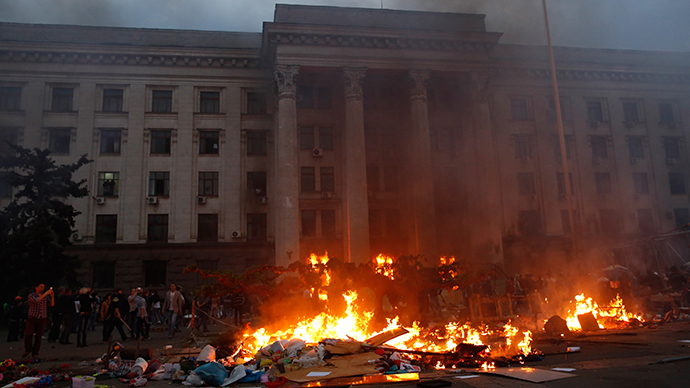 However, Tatyana denied this information saying that all the people who were killed on May 2 came from Odessa. Those who died in the ablaze “were innocent civilians who wanted to live a normal life rather than just ‘survive’ – as is now the case in Ukraine,” Tatyana said, adding that the Kiev coup-appointed authorities are to blame for these crimes. “The guilty party is the current government, which clearly seeks to divide Ukraine,” she added. "Yeah, women sit at home with their children and this one's an animal!" added another. 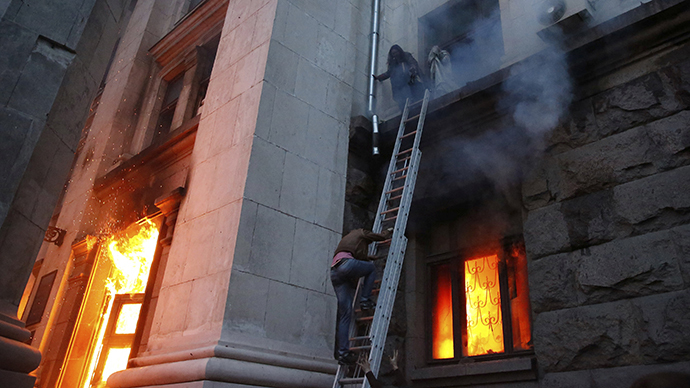 According to the acting Prosecutor General Oleg Makhnitsky, it is too early to say what exactly caused the blaze but the investigation is looking into several theories. The cause of the fire could be both Molotov cocktails thrown by the anti-government protesters and the blaze made by pro-Kiev activists, he said. Ukraine will invite independent experts mostly from the US to investigate the case, added Makhnitsky. 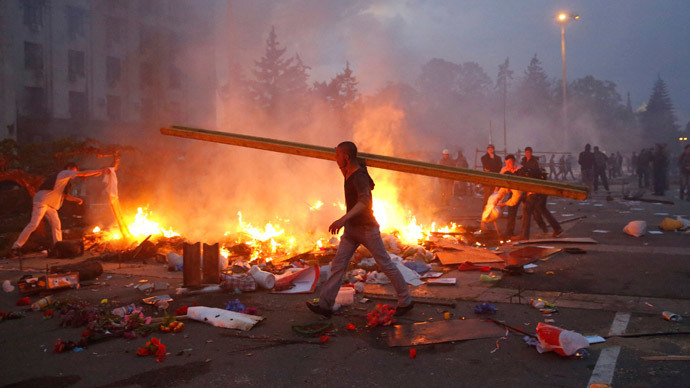 On Wednesday, Russian FM Sergey Lavrov said that what took place in Odessa on May 2 is "typical fascism" and Russia "will pursue the truth," adding that Moscow will not permit Odessa’s events to be "swept under the carpet."